So many burgers are so much like In-N-Out. That's not a bad thing. Freddy's Frozen Custard & Steakburgers, a chain with roots in Kansas stretching back to the '50s, may have been doing their "steakburgers" the same way for decades, but they sure do taste like In-N-Out. Fresh (never frozen) lean beef in hand-formed patties sizzled to nice, almost crisp charred-ness, loaded with lots of melty American cheese-type stuff. There's mustard, onions and really nice, thick medallions of dill pickle on this bad boy, all sandwiched in a butter-toasted bun. 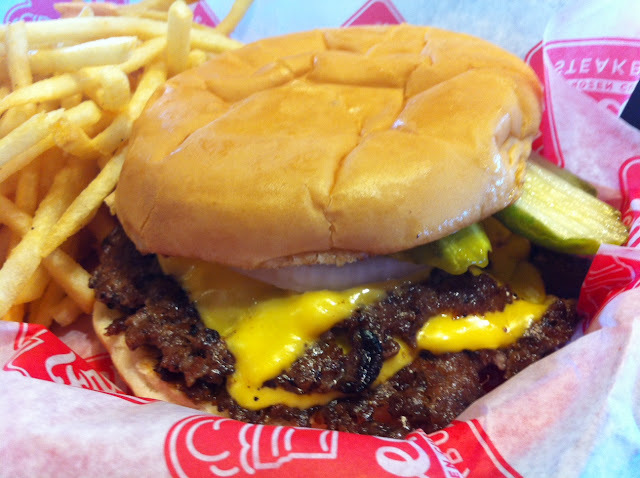 It's a classic American cheeseburger times two, and it works. Freddy's shoestring fries are good, too. Freddy's frozen custards are good, too. As far as nostalgia burgers go, you could do so much worse.